VitalSource eBook access code and instructions will be provided within the print book. First published in 1991, Human Sectional Anatomy set new standards for the quality of cadaver sections and accompanying radiological images. Now in its fourth edition, this unsurpassed quality remains and is further enhanced by the addition of new material. The superb full-colour cadaver sections are compared with CT and MRI images, with accompanying, labelled, line diagrams. Many of the radiological images have been replaced with new examples for this latest edition, captured using the most up-to date imaging technologies to ensure excellent visualization of the anatomy. The photographic material is enhanced by useful notes with details of important anatomical and radiological features. 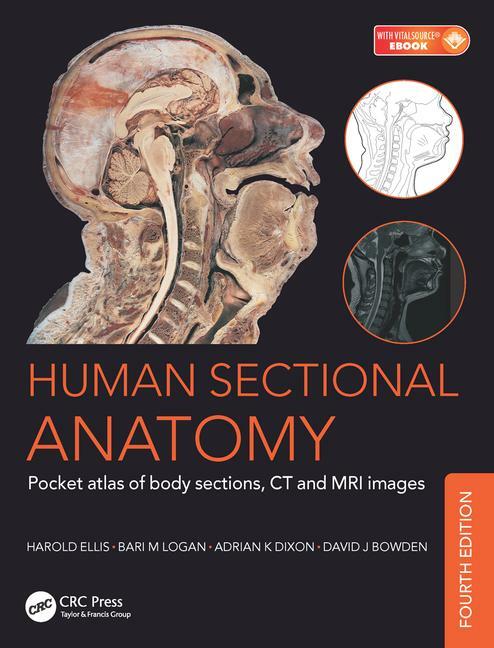 Beautifully presented in a convenient and portable format, the fourth edition of this popular pocket atlas continues to be an essential textbook for medical and allied health students and those taking postgraduate qualifications in radiology, surgery and medicine, and an invaluable ready-reference for all practising anatomists, radiologists, radiographers, surgeons and medics. BRAIN. Superficial dissection. Selected images. HEAD. Axial sections (male). Selected images: axial MRI. Selected images: temporal bone/inner ear: axial CT. Coronal sections (female). Sagittal sections (male). NECK. Axial sections (female). Sagittal sections (male). THORAX. Axial sections (male). Axial sections (female). Selected images: heart. Selected images: mediastinum: axial CT. Selected images: coronal MRI. Selected images: coronal chest CT. Selected images: coeliac and great vessels. ABDOMEN. Axial sections (male). Axial sections (female). Selected images: lumbar spine: axial CT. Selected images: lumbar spine: coronal MRI. Selected images: lumbar spine: sagittal MRI. PELVIS. Axial sections (male). Selected images: coronal MRI (male). Axial sections (female). Selected images: axial MRI (female). Selected images: coronal MRI (female). Selected images: sagittal MRI (female). Selected images: colon. Selected images: coronal abdominal CT. LOWER LIMB. Hip: coronal sections (female). Selected images: pelvic girdle. Thigh: axial sections (male). Knee: axial sections (male). Knee: coronal sections (male). Knee: sagittal sections (female). Leg: axial sections (male). Ankle: axial sections (male). Ankle: coronal sections (female). Foot: sagittal sections (male). Foot: coronal sections (male). UPPER LIMB. Shoulder: axial sections (female). Shoulder: coronal sections (male). Arm: axial sections (male). Elbow: axial sections (male). Elbow: coronal sections (female). Forearm: axial sections (male). Wrist: axial sections (male). Hand: coronal sections (female). Hand: sagittal sections (female). Hand: axial sections (male). Selected images: shoulder girdle.